Remembering a dish I had at a restaurant a while ago I thought I’d try to make something similar at home. 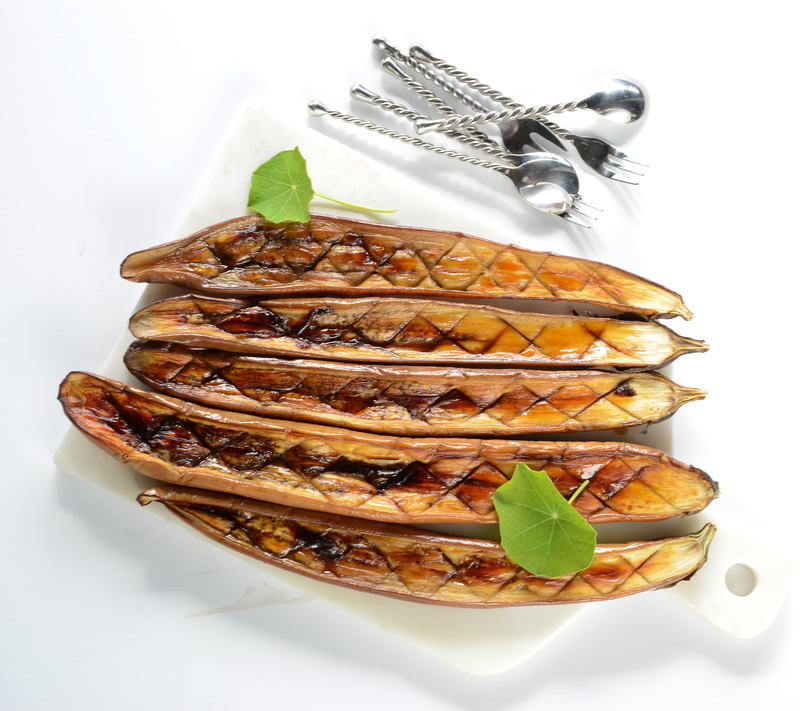 The dish was an elongated Asian eggplant, cut in half and roasted with a sticky, sweet and spicy sauce similar to teriyaki. Rather than buy a bottle of the sauce which would be full of artificial ingredients, I thought I’d try to make it myself. The sticky-gooey sauce was quite good so onto these pages it goes. When roasting the eggplant be careful not to overcook it or it will be too mushy. You can serve the eggplant as pictured scooping out the flesh with a spoon, or scoop out the flesh from all the eggplants, place in a serving bowl and serve it with rice and other Asian side dishes. The sauce itself is quite useful where a teriyaki sauce is called for. 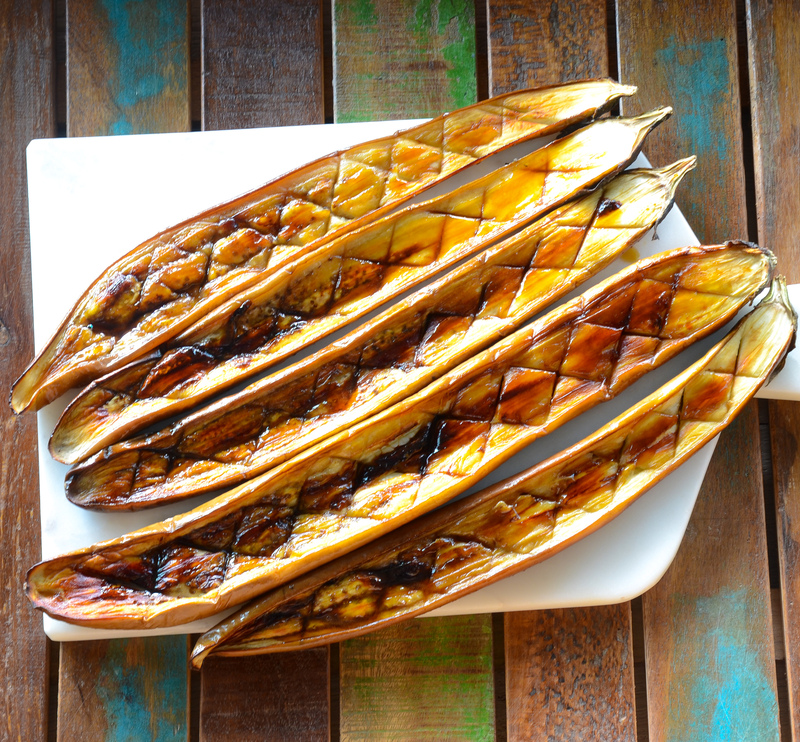 Cut the eggplants in half lengthwise and set on a baking tray. With a sharp knife make diagonal cuts to create an X shape pattern on the eggplant’s flesh. 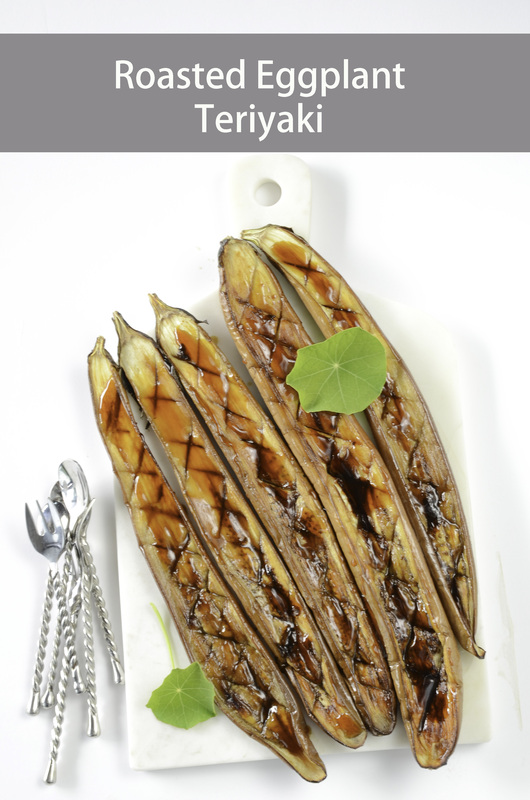 Brush a little teriyaki sauce over the eggplants. Place in a preheated 400F oven and roast until tender, stopping halfway through to brush with more teriyaki. Combine soy sauce, brown sugar, honey or agave, grated ginger, garlic, rice vinegar and mirin in a small pot and bring to a boil. Lower heat and cook for 15 minutes. Remove from heat and strain the sauce into a measuring cup. Wash the pot and then pour the strained sauce back into the pot. Return to heat and bring to a simmer. Slowly drizzle in the cornstarch water mixing with a whisk. Cook the sauce until thickened. Use as needed or store in glass jar in the fridge.